The fun and interest in building and creating with LEGO’s can follow a kid right into adulthood. I know a guy (not the guy in the photos) with a huge collection and though now without much time with career and other responsibilities, is still, unashamedly, an enthusiast. 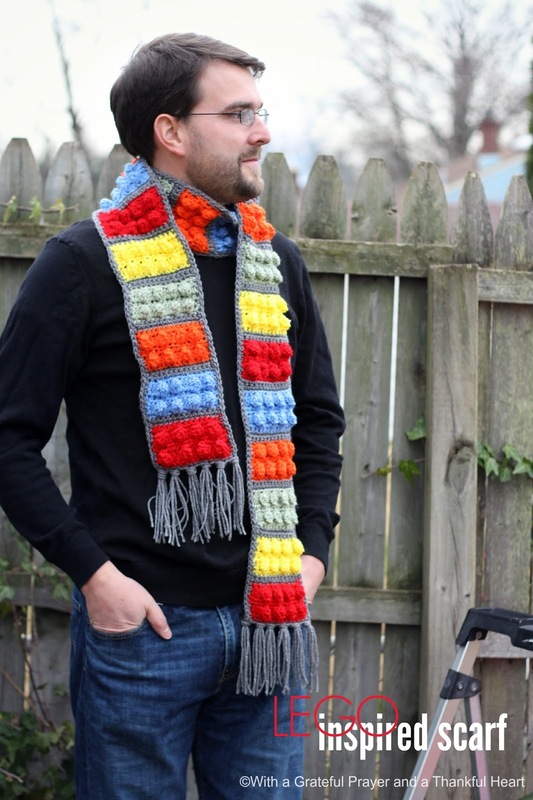 This crochet LEGO scarf is a gift for my daughter’s boyfriend and my son-in-law bravely modeled it for me before I gave it away. 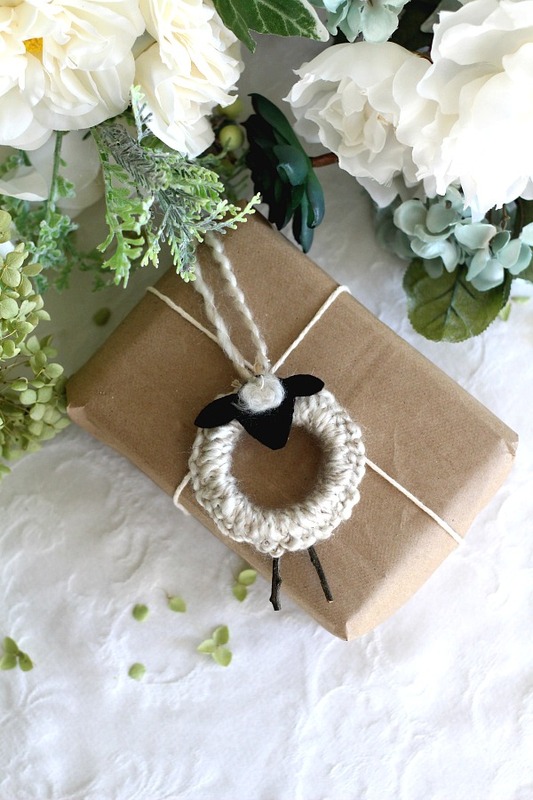 It’s a great yarn stash-buster project too. Colors: Choose whatever colors you want for each brick and as many different colors as you like plus a contrasting color for trim. Single crochet in each chain across (14). Chain two and turn. *1 double crochet in each of the next 2 single crochets. 5 double crochets in the next single crochet. 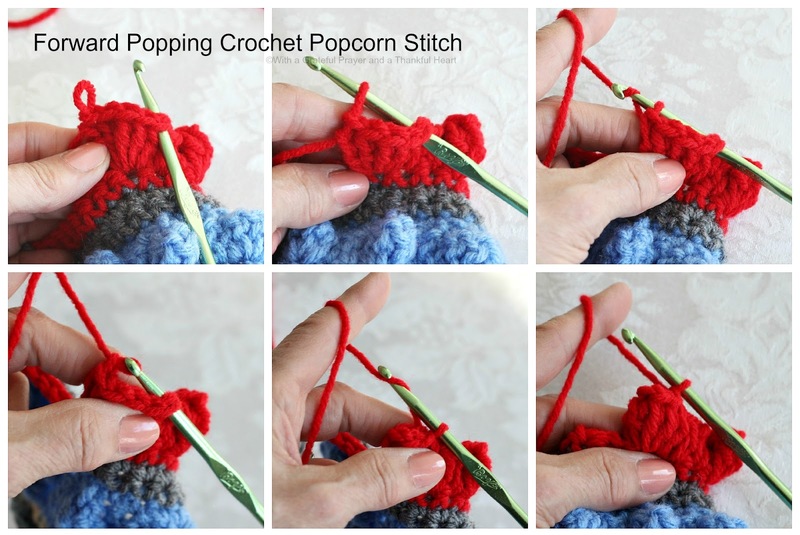 Drop the loop from your crochet hook. 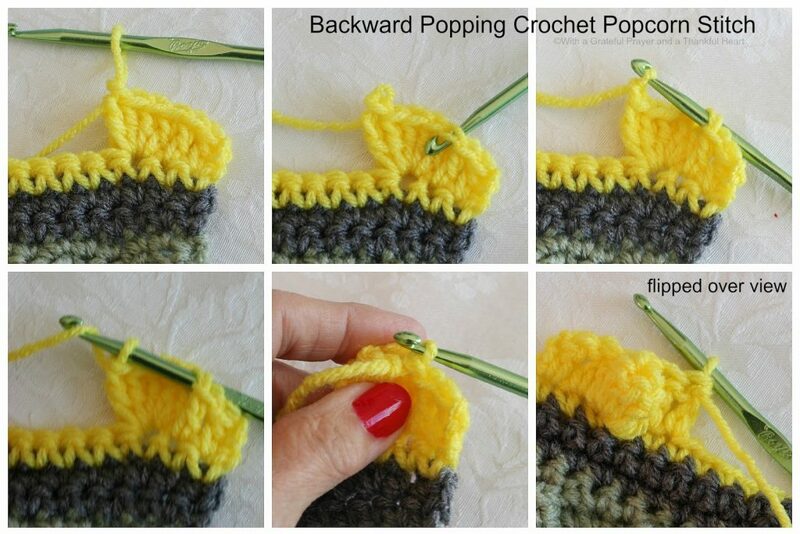 Insert hook through the dropped loop; yarn over and pull through the stitch. Chain 1*. repeat row 2 but chain 1 instead of 2 at end of row. Sc in each stitch across (14)ROW 9 (Making BACK facing popcorn clusters) These are the same as front facing popcorn clusters but you insert crochet hook from back to front this time. Continue crocheting blocks and gray rows until desired length of scarf is reached. 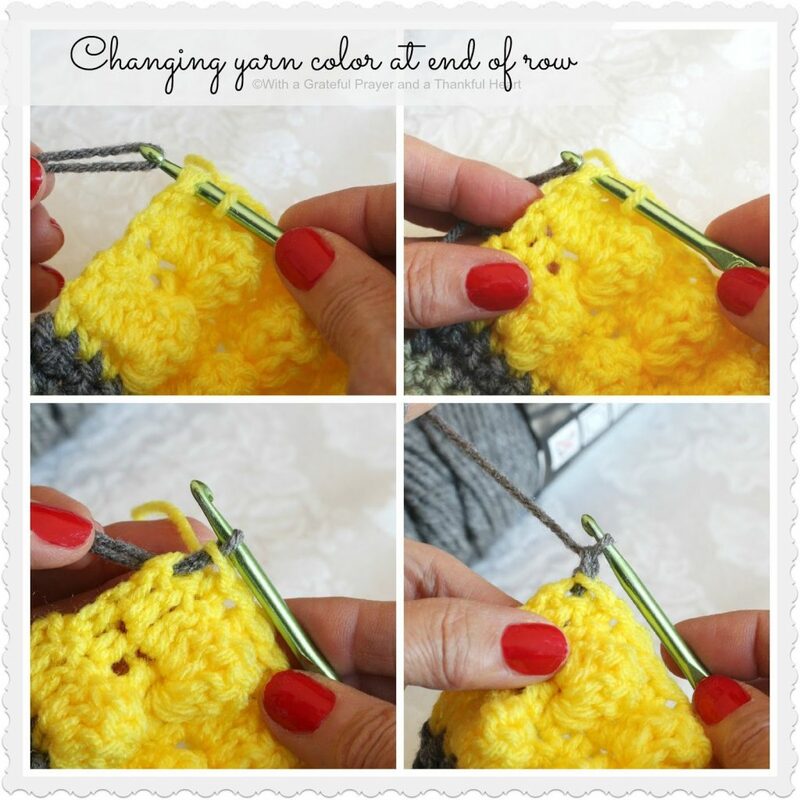 With gray, crochet a row of single crochet spaced evenly around the outside edges of the scarf. 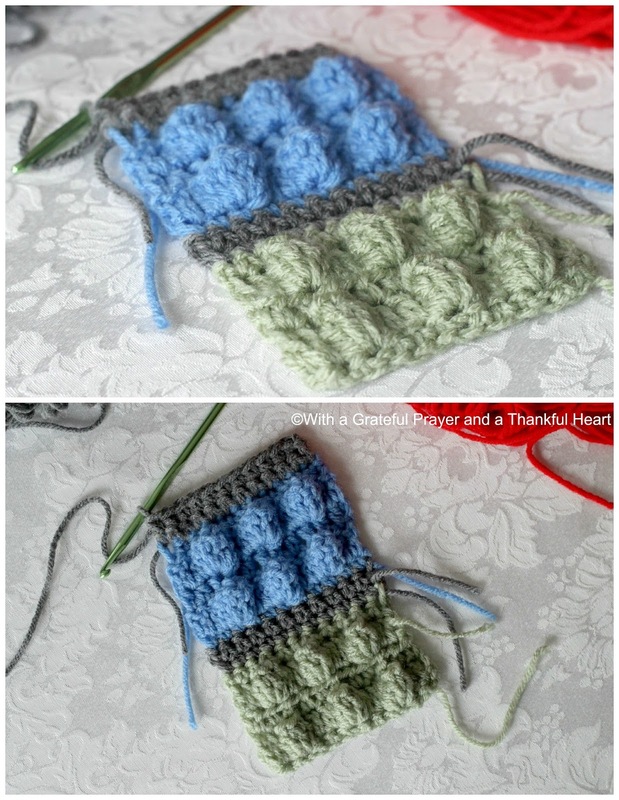 To make the corners turn nicely, work 3 single crochet in each corner. The difference from the adult version of this LEGO scarf is that the brick consists of three popcorn clusters in each row instead of four. Follow the above pattern but begin with a chain 12 rather than chain 15 and each row will have 11 stitches . 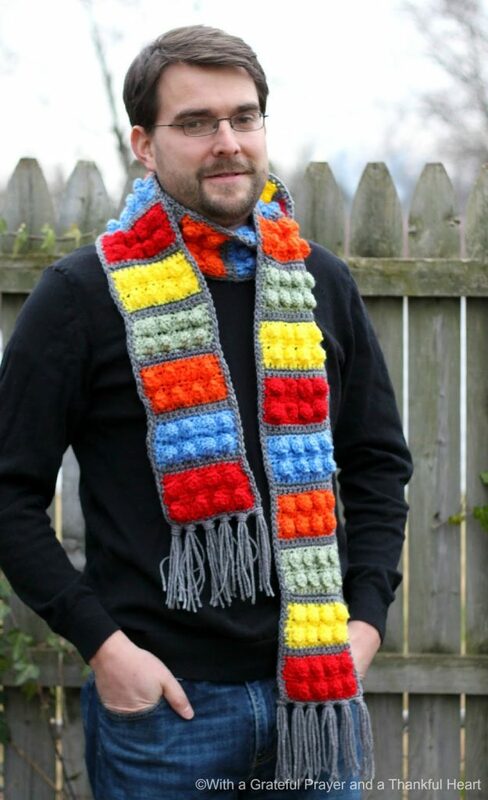 Continue until the scarf reaches desired length. My twin brother and I turn 50 next month – we loved playing with legos as kids and now he is an architect. A perfect gift to tie childhood memories in with adulthood. Thanks for the pattern. What a classy looking scarf! My son-in-law is a "Legos" fan, and I know this would be his style. You have a handsome model! What a super cute idea! Great and easy tutorial! Our lego collection in this family goes back to my brother's set .. and now the grandchildren enjoy the old and their new ones. 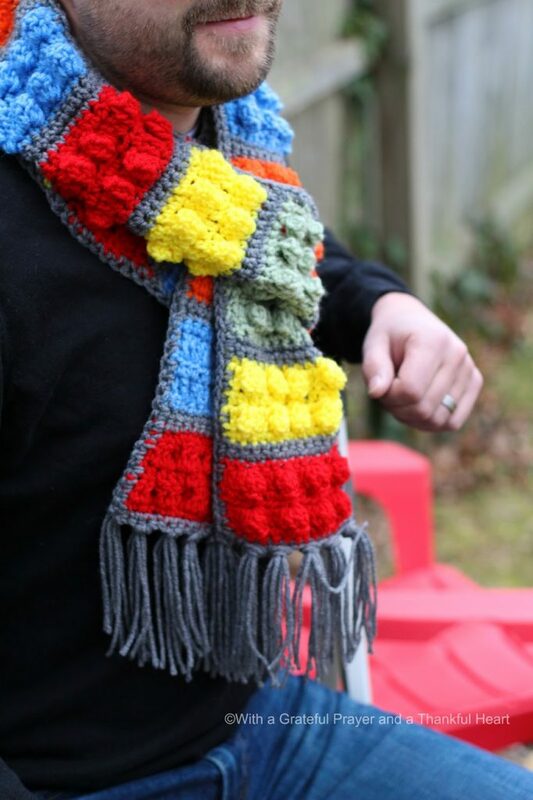 How clever to make a lego scarf. It does look like legos! What a great looking scarf! I know my sons would love this. Thank you for sharing the pattern! That is so clever! We have a family full of Lego enthusiasts. What a cute idea! Oh, our Grandson is obsessed with Legos and he would probably love this. So cute! My grandson would love this. Thanks. I would love to do this but somehow as a hat…for our grandboys. Any suggestions? Your son-in-law makes a great model. That scarf is great. How fun to have a Lego scarf. Now I'm wondering if that big bucket of Lego's my son had is still in his closet?